Speaking to your management team or all staff is always a big event, so it does pay to know how to give your year end speech. That’s because you really want to make the most of this special event. Your year end speech will set the tone and mood for the new year ahead. Plus, when you get it just right, it will set the direction for everyone and build that collective feel-good factor that’s so important in the modern workplace. You’ve probably already tackled your office party speech this year. Therefore, this public speaking video aims to help you out with best practice tips for how to give your year end speech. Set the tone for the year ahead. Importantly, set the pace for the new year. Define the mood for the new financial/ calendar year. And, Recognise the commitment of everyone involved. Of course your audience will receive your year end speech with all the enthusiasm that it deserves. So, you can expect some good reaction to your words. Because that’s the reaction you want since you learned how to give your year end speech. 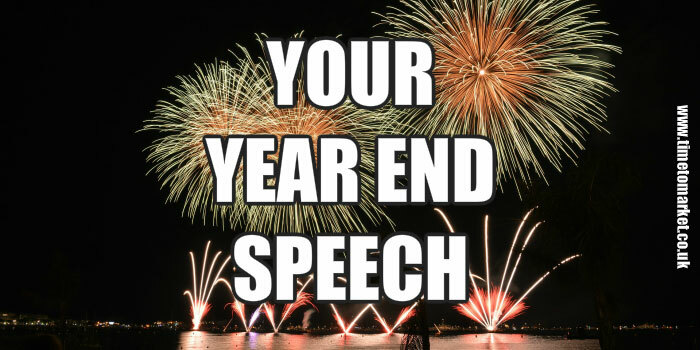 And, now that you know how to give your year end speech, you can do the same trick again at a different event. Perhaps at the end of the financial year, or an annual general meeting. It’s really very simple when you know how.